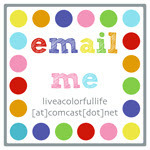 Live a Colorful Life: WIP Wednesday: Does the noise in my head bother you? WIP Wednesday: Does the noise in my head bother you? 1. I really like Steven Tyler as an American Idol judge. 2. 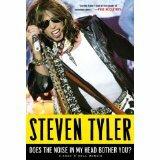 Although it is highly doubtful that I will read it, the title of his new book is genius. 3. I can guarantee that the noise in Steven's head has nothing whatsoever to do with quilting. 4. I can also guarantee that the noise in my head is all about quilting, i.e., fabric, design, quilts I'm working on, quilts I want to be working on, why do I not have enough TIME? ?, etc. 1. Single Girl quiltalong: actual progress made this week. Did anyone sew these arcs together without a gazillion pins? It.takes.so.long.to.pin. 2. Flea Market Fancy Popbeads: waiting to be basted so hand quilting can get started. 3. 3x6 Mini Block Exchange: pattern chosen; fabrics not chosen yet--but it's a start, right? 4. Birdie Stitches. No progress this week. 5. Hexagon Charm quiltalong. Sporadic progress being made. 6. Bottled Rainbows quiltalong. All base blocks completed. This has led to a corresponding idea for my next donation quilt that I'm really excited about--details to follow. 8. Outside Oslo sewing marathon. I can hardly wait to show you what I'm working on! 1. Amy's Creative Side quiltalong (um, making two separate quilts because the fabrics in the first were screaming at each other). 2. Hexagon quiltalong by Jaybird Quilts. 4. Baby Geniuses quilt--needs to be quilted and then sent to a friend in Massachusetts I've never actually met but who I know will love the quilt because she is a scientist. 1. Tokyo Subway Map quilt (although my plan is to change it to the Portland MAX lightrail map). 2. 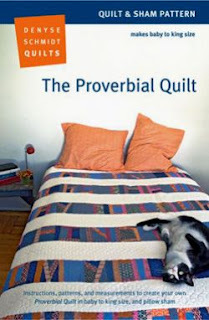 The Proverbial Quilt (making all the words out of fabric that has words printed on it). 3. Block-a-Palooza quiltalong using Sunkissed by Sweetwater. Not started. 4. That Girl, That Quilt quiltalong using Sherbet Pips--Not started. 5. Carla's awesome quilt pattern. Fabric chosen. 6. Spool Play quiltalong development. 7. Pattern development for Moda Bake Shop. 8. Other ideas, too numerous to mention, all clammering for some attention. So tell me. Do you have a lot of noise in your head too? 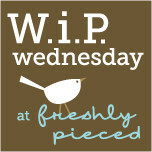 Don't forget to head over to freshly pieced to see what everyone else is up to today. 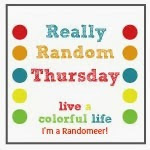 And you still have a few hours to read about the Name Game, say hi to Julia of little girl quilts, and enter the giveaway. Oh, swoon!!! I love those Outside Oslo fabrics, can't wait to see what you do with them!! And I'm with you, the noise in my head is all about quilting, especially the quilts I'm not working on yet that I want to be working on. As for your Single Girl, I wound up buying extra boxes of pins, so I could sit and pin all of the arcs to the backgrounds without having to stop, sew, and repin because I ran out of pins. I can't wait to see your hand quiliting on your FMF Pop Beads, I'm so excited!! Oh Yes! But I don't think I have nearly as much noise as you! You must be a list maker....I don't know how you remember it all. Every quilt mentioned sounds very enticing! LOL - it sounds like my brain in here! It's constant, when can I sew next, what do I want to work on first. lol! I'm seriously afraid of the Single Girl because of all that pinning. Love that fmf popbeads though. So fun! I'm impressed! If I have more than one thing to do at a time it makes me stressed. That white quilt is looking gorgeous. Is the whole thing white? Your hand quilting is just amazing. wow! your list is impressive! mine consists mostly of quilt tops waiting to be quilted. lucky for me, my machine just got back from the fixin'-shop! ps--love the title of the book too! I've heard that Steven Tyler is a good judge on American Idol. I should try watching it sometime. I love your list, especially the categories! I am intrigued by the 3x6 Mini Block Exchange - tell me more about that. I have trouble with the works screaming in my head too - should I start them, should I add them to my to do list, or should I ignore those noises in my head?! I have LOTS of noise in my head too! This was a great post--so much to think about and come back to! I don't have much to contribute, but I like how you sectioned off the post and laid it all out for us. It's good to take an inventory once in a while, and with summer (last day of school for me is tomorrow--yay!) coming on, I should get my thinking organized--just like you! Sounds like you're busy, but with lots of great stuff! That white quilt is absolutely AMAZING! So, so beautiful. Boy, you do have a lot going on in your brain! I'm the same way but I usually end up forgetting about half of it! ha! I used a million pins when I pinned the arches of my Single Girl and when I posted it on the Flickr group several women noted their amazement and gave advice about not using so many pins. My blocks lay flat as flat can be though so I'm happy I did it my way. It's what worked for me. Ha, I call them WIMMs (Works In My Mind) - they're noisy, too. I love your wholecloth/all white quilt. I have one of those on my Quilting Bucket List. I don't get stressed by big lists like yours; I've got my own and they help me keep the noise inside my head at a dull roar so that I can actually lead something resembling a normal life. I thought there was way too much noise in my head, but after reading your list, I think I should maybe relish in the quiet! Good luck! Your list makes me freak out a little...you have so much going on! Ummmm, WOW, what a list, but it looks like such fun! I am lovin' the FMF quilt. Happy WIP Wednesday. We definitely haven't forgotten. Given up expecting it soon, but haven't forgotten. Sorry to break the news. oh my, you have alot going on! They all sound lovely, tho! I DEFINITELY would not recommend attempting the Single Girl without pins. I know it's annoying, but it's gotta be done. And, what's this about a Spool Play quilt-along?? Yes please!!! The curves do take time to sew I have not done much in that area yet but would love to one of these days. Laking in patients here for that. Love your beads quilt and your hand quilting is fantastic. Whoa there Nelly! You have a gazillion things going on! I love it all, though, thanks for the peak into your WIPs! ok, the noise in YOUR head is giving ME and headache. I thought I was crazy falling asleep thinking about all the projects I want to make, but you have so much ambition. I need to get off the computer and stop reading all these blogs and just sew. Thanks for the kick in the behind!